As she’s portrayed here, the versatile and charismatic Mary Seacole may have been a top self-promoter, but she was also a comforter and healer of the sick and wounded, on a par with Florence Nightingale. Seacole accomplished much in her life, particularly considering “the unhelpful circumstances of her gender and colour, her time and place,” writes social-historian Robinson (Women Out of Bounds, 2003, etc.). She was born, in 1805, a mulatto in the hyper-caste system of Jamaica that made her a black yet the most respected in the social hierarchy, a position that gave her confidence and no sense of inferiority. Drawing from scant resources—Seacole’s autobiography, newspaper clippings, some ephemera of those who knew her—Robinson does well getting at Seacole’s character. She was the daughter of a doctress and lodging-house keeper, trades that she would herself pursue throughout life. She was a restless patriot, very much her own woman, one who decided on “her own accomplishments without reference to others’ permission or expectation,” yet “a public person, to whom recognition and approval by those she considered to be in authority were just as important as self-satisfaction.” A complex being, then, given to the service ethic, which, if it served her aggrandizement, so much the better. That’s what makes her so pleasingly human in Robinson’s hands: She had to make her own way, even when tending to the needs of Her Majesty’s troops in the Crimea or succoring yellow fever victims in Panama, at once a restaurateur and a merciful angel, a grandly optimistic personality who, even in her self-glorification, puts the dour, class- and race-conscious Florence Nightingale in her place. 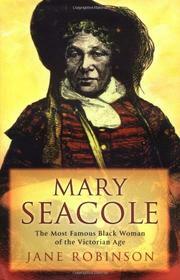 Seacole catered in bodily comfort and spiritual salubrity, traded on her contacts, did the needful in giving and in getting by. A smart, tightly focused character study, by turns skeptical and generous as either is called for, of a woman worth the effort to know.